Recognize and honor your organization's graduates, achievers and donors with unique awards and accolades by Maria Thomas. Elevate your organization's image and your recipient's stature. 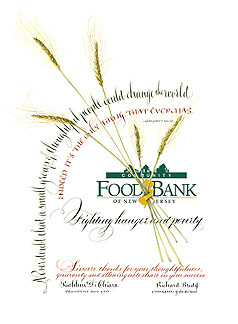 CNJFB commissioned Maria to create this award template to honor their many generous donors. This award quotes from Margaret Mead, "Never doubt that a small group of thoughtful people could change the world. Indeed it's the only thing that ever has." "Maria, thank you again. Your art has upgraded our organization and I know our donors will love receiving these awards." As new donors qualify, Maria will inscribe prints of this award. 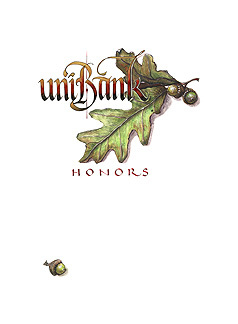 Simple, bold and elegant, this repeating award beautifully integrates this bank's oak motif. For commemorating unique individuals and milestone events, please see our Unique Awards section.